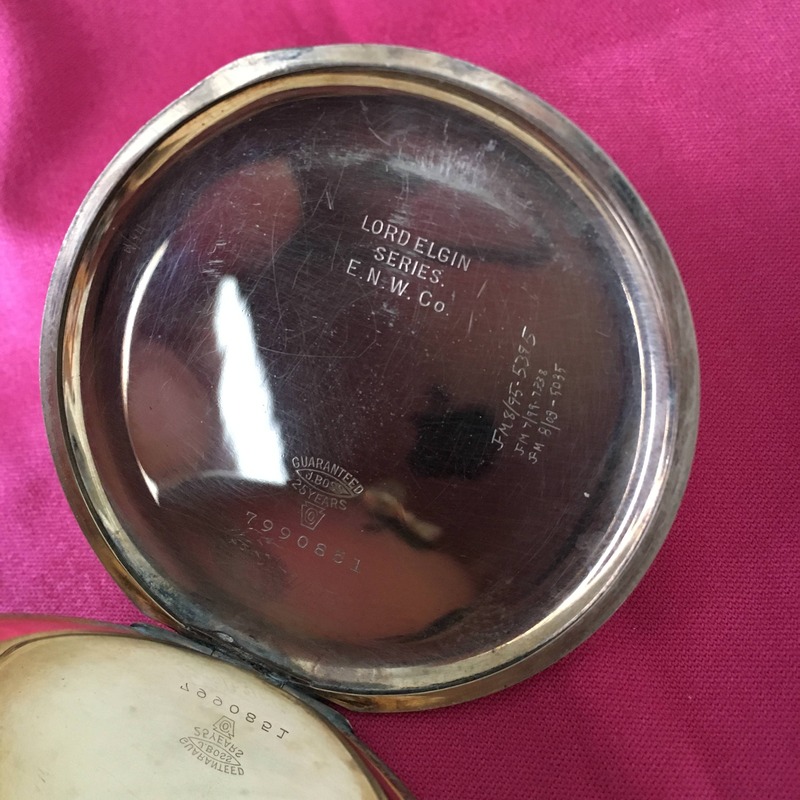 My great-grandfather's Lord Elgin pocket watch, built 1911 or thereabouts. I don't carry it, but I wind it and use it as a desk clock occasionally. 15 jewels, size 16s movement. Last edited by Selym on Fri Dec 01, 2017 5:32 pm, edited 3 times in total. I love seeing pieces like this. Being from 1911 is no joke. How is the time keeping? Myles that's really cool! DefInitely an heirloom to cherish. 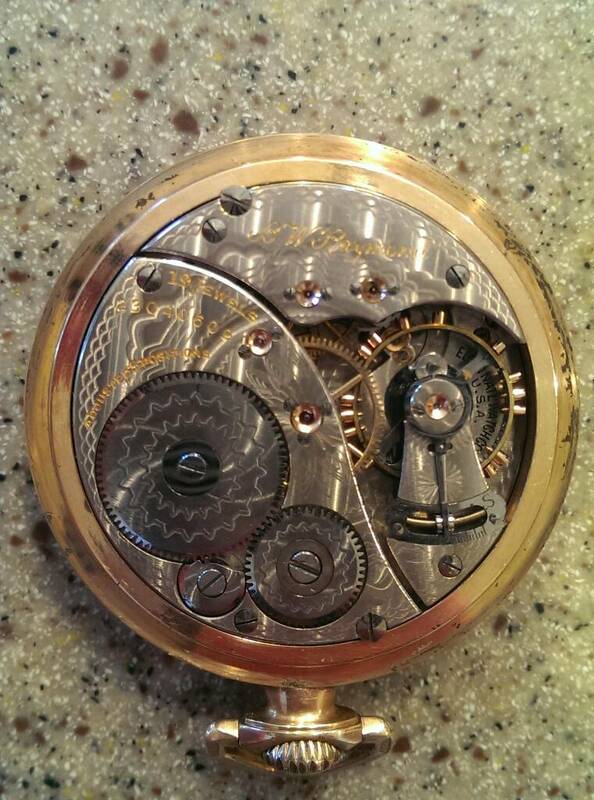 I also have my Grandfather's Elgin pocket watch he used while working on the L&N Railroad. It has the Benjamin W Raymond railroad grade movement and dates to 1921. Wound it once to see if it works and it does, but I'd rather get it serviced before trying again. It gains about 20 seconds per day sitting on my desk. 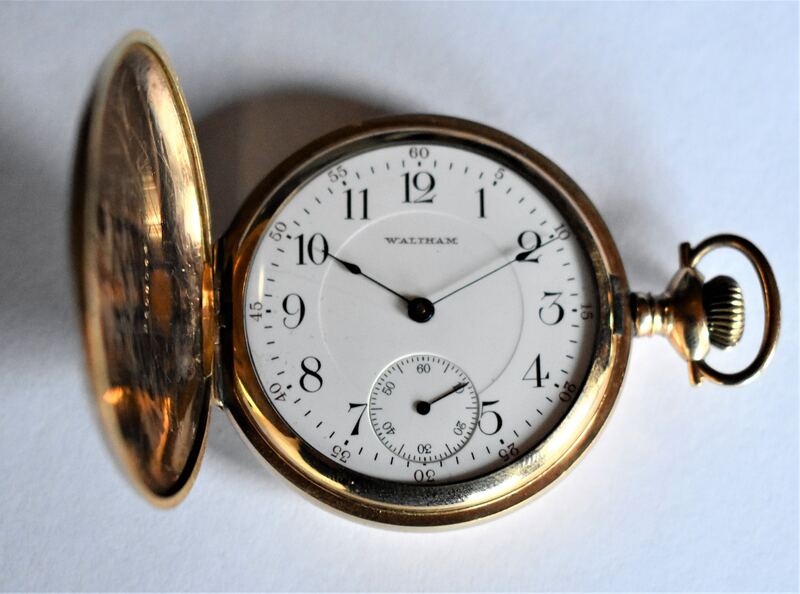 IWW overhauled it in 2011, and based on the markings inside the case, it was serviced in '95, '99, and '03. 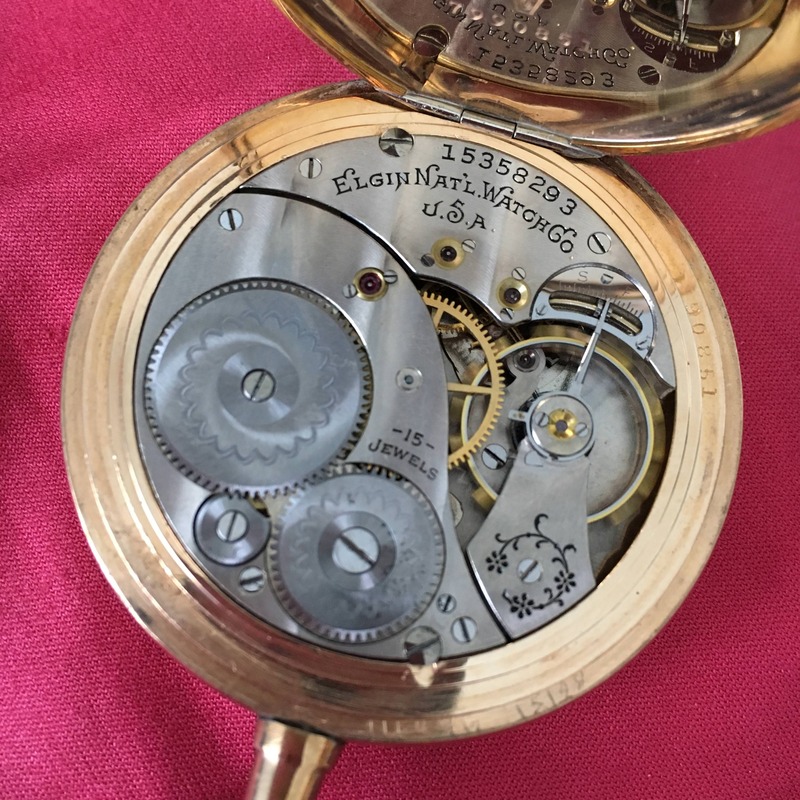 Not bad at all for a 100+ year old movement. Nice watch! That's a higher-grade movement than what's in mine. Very cool to see some others here. 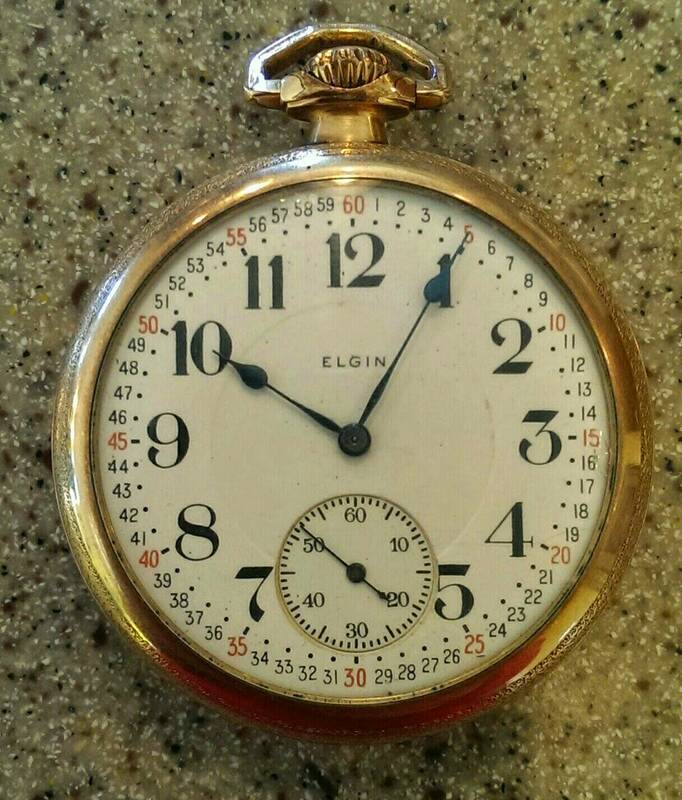 I have my great grandfather’s Elgin from 1908 and had it serviced a few years ago. Took my watchmaker a while as 3 jewels were cracked and he could not find the right sizes. After several attempts, he finally bought a donor movement to scavenge jewels. I’ll pull it out and post some pics of it this weekend. 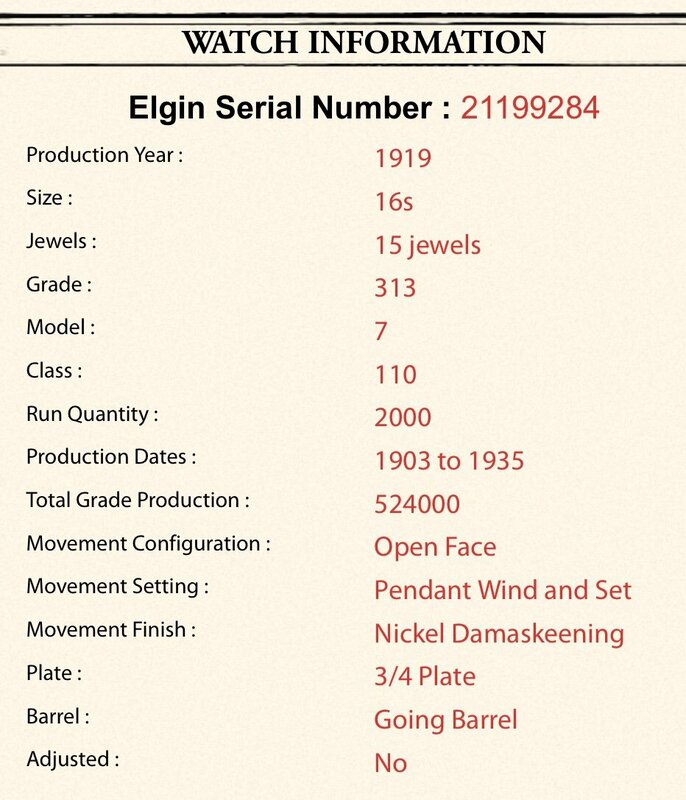 Where’s the Elgin serial number search website? I’d love to look mine up too. 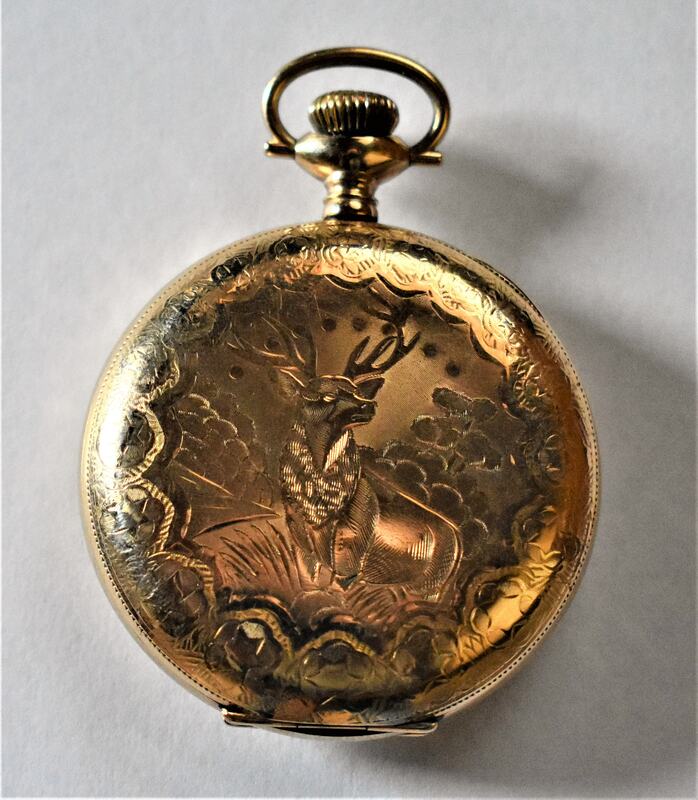 Nice watch glad it stayed in the family to many after family members pass away are sold off and most the cases are melted down for the gold and silver content. 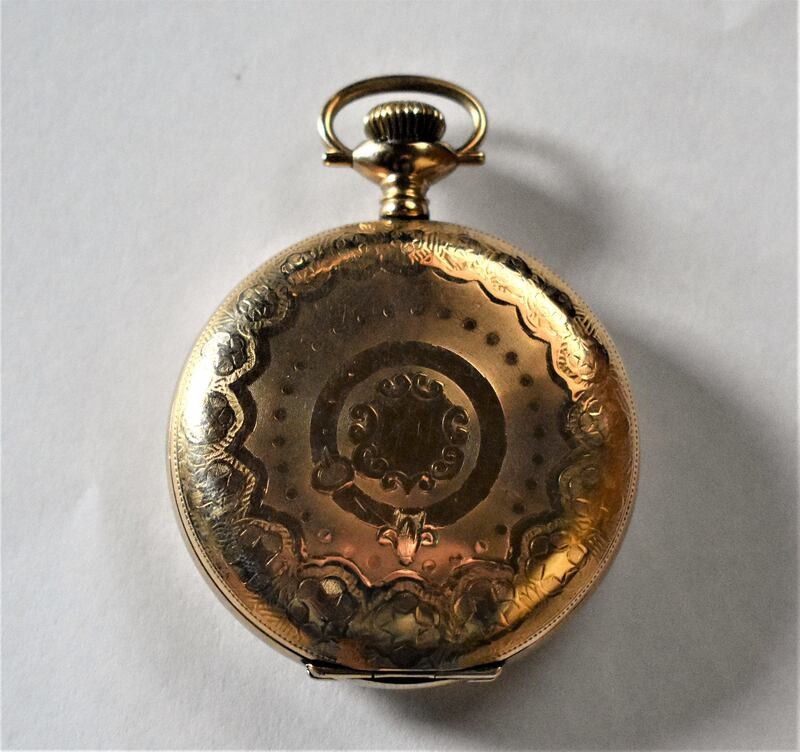 My Dad gave me my Grandfathers pocket watch given to him on his 21st birthday around 1906. This is made by Waltham with a 17 jewel hand wind and stem set movement in a real nice Hunter case with a cool Elk on the back. 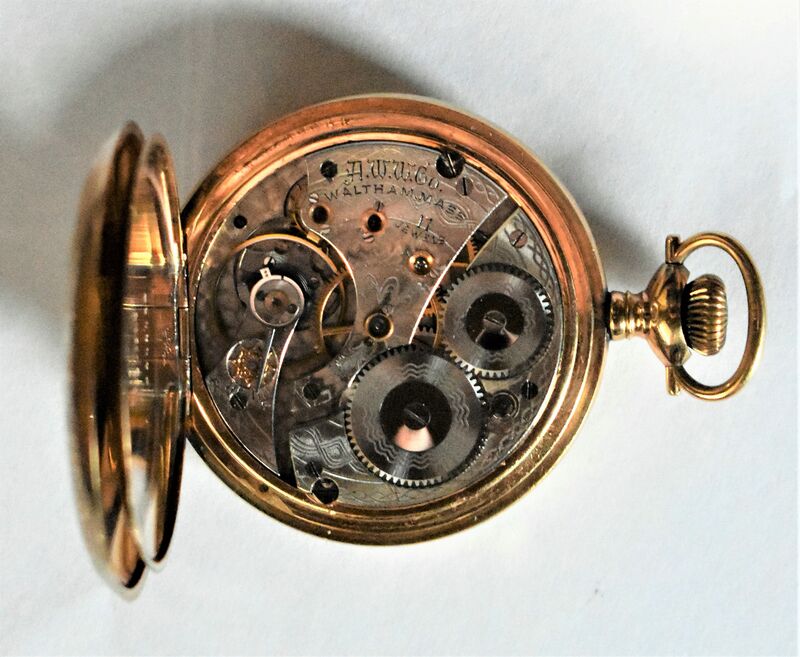 Pocket watches got me into this hobby I bought my first pocket watch after I got my first real job out of the Navy a Hamilton 992 railroad pocket watch at a pawn shop in Hayward CA in 1986 and then got my Grandfathers pocket watch and I went crazy with this hobby. 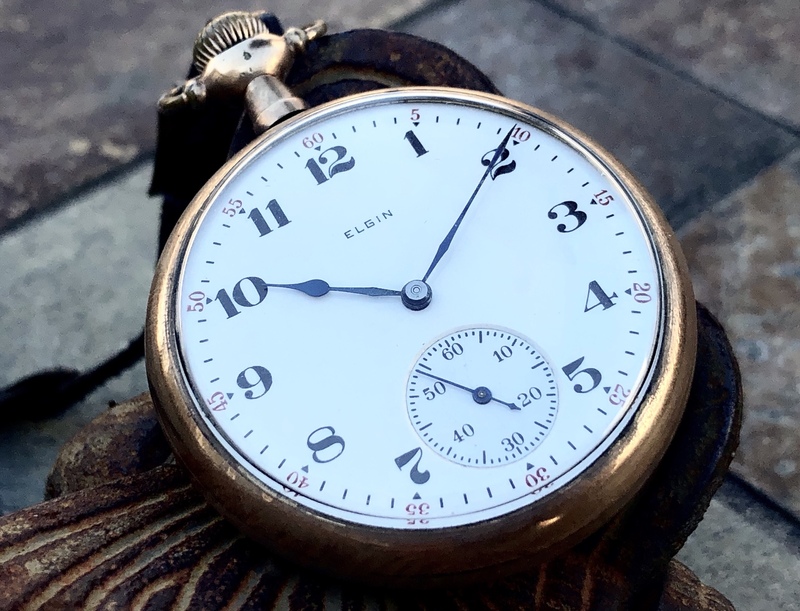 Looking back at the watchmaker’s notes, he said the watch dated to 1918, not 1908. 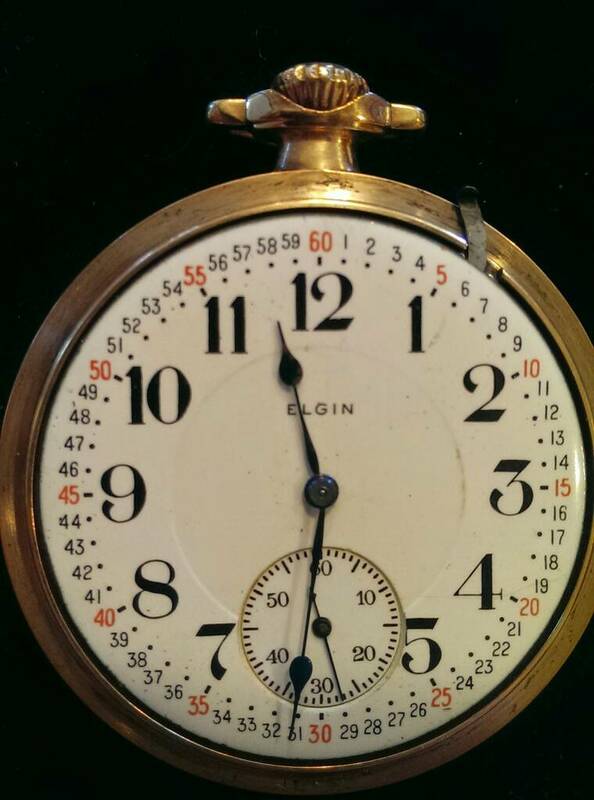 The Elgin numbers site says 1919, so pretty darn close. Here it is and I think I’ll take it to the Denver GTG tomorrow for something different. 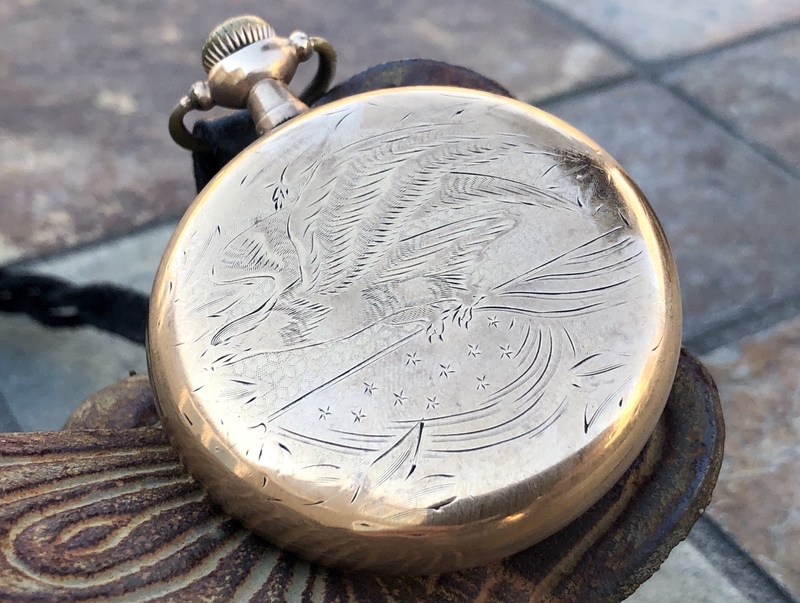 River Rat wrote: Nice watch glad it stayed in the family to many after family members pass away are sold off and most the cases are melted down for the gold and silver content. BacoNoir wrote: Looking back at the watchmaker’s notes, he said the watch dated to 1918, not 1908. 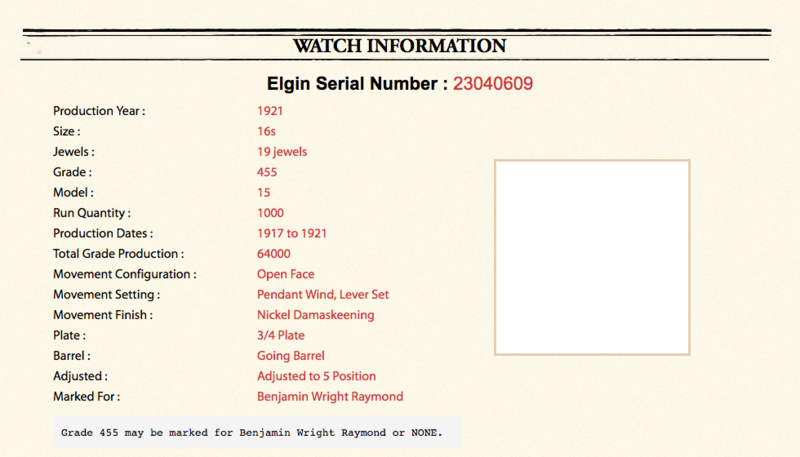 The Elgin numbers site says 1919, so pretty darn close. Here it is and I think I’ll take it to the Denver GTG tomorrow for something different. Love that engraving on the back. Love that engraving too. 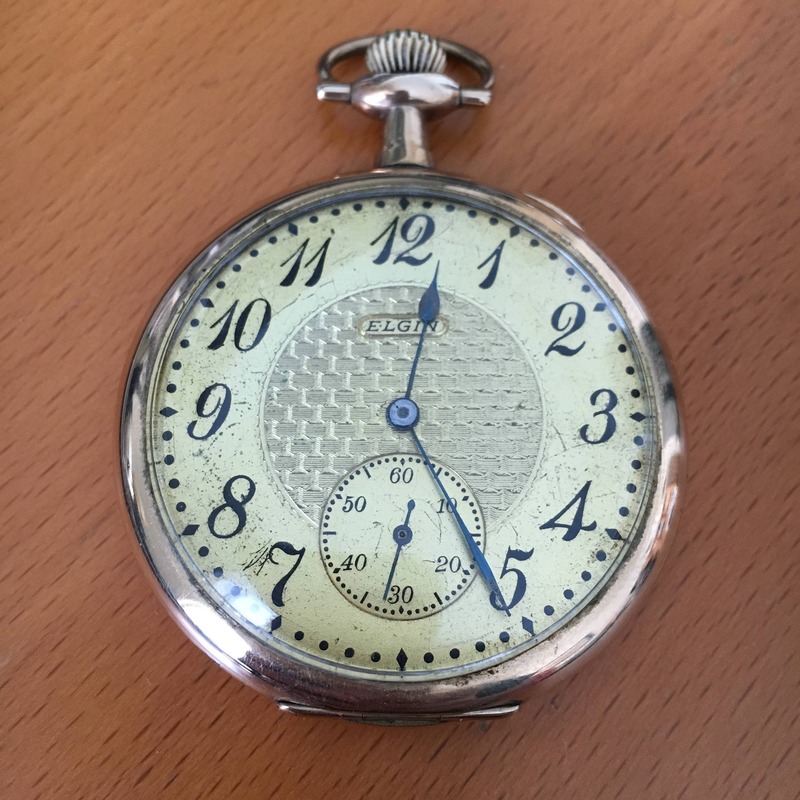 Very appropriate and patriotic for a watch produced just after the First World War.